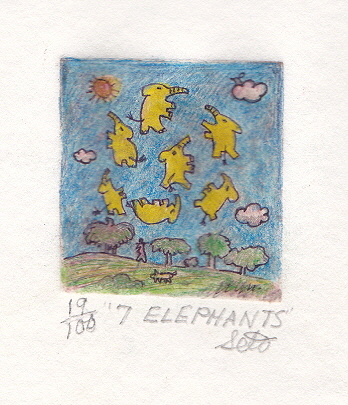 Fantastic happy and funny print by Benson Seto from Hawaii with lots of flying elephants. Paper size: 20*25,5 cm (7,9*10 inch). This print is ready to frame as it is mounted on a cardboard passe-partout. Signed by the artist. The size of the edition is 100.